Berns, Laurence and Eva Brann, Abraham Lincoln: The Gettysburg Address, America, Constitutionalism, (University of Dallas Press; June 1976). Black, Linda Giberson, Gettysburg Remembers President Lincoln: Eyewitness Accounts of November 1863, (Thomas, 2005). Boritt, Gabor S., The Gettysburg Nobody Knows, (Oxford University Press; 1999). Bullard, F. Lauriston, "A few appropriate remarks": Lincoln's Gettysburg Address, (Lincoln Memorial University, 1944). Carson, Herbert L., "Nor Long Remember: Lincoln at Gettysburg", (Pennsylvania History, October 1961). Clausius, Gerhard P., Mr. Lincoln Goes to Gettysburg, (Lincoln Fellowship of Wisconsin, 1980). De Alvarez, Leo Paul S., editor Abraham Lincoln, The Gettysburg Address and American Constitutionalism, (University of Dallas Press, 1976). Hoch, Bradley R., The Lincoln Tail in Pennsylvania, (Pennsylvania State University Press, 2001). Gramm, Kent, November: Lincoln's Elegy at Gettysburg, (Indiana University Press; 2001). Jaffa, Harry V., A New Birth of Freedom, (Rowman & Littlefield, 2000). Jervey, Edward Drewry, "A Study of the Gettysburg Address", (Lincoln Herald, Spring 1959). Fortenbaugh, Robert, Lincoln and Gettysburg, (Bookmart, 1945). Fortenbaugh, Robert, "Abraham Lincoln at Gettysburg, November 18-19, 1863", (Pennsylvania History, October 1938). Frothingham, Paul Revere, Edward Everett, (Houghton Mifflin, 1925). Frank L. Klement and Steven K. Rogstad, The Gettysburg Soldiers' Cemetery and Lincoln's Address: Aspects and Angles, (White Mane Publishing Co.; 1993). Kuhnhardt, Jr., Philip B., A New Birth of Freedom: Lincoln at Gettysburg, (Little, Brown, 1983). Nicolay, John G., "Lincoln's Gettysburg Address", (The Century Magazine (February 1894)). Simon, John Y., Harold Holzer, and William D. Pederson, editors The Lincoln Forum: Abraham Lincoln Gettysburg, and the Civil War, (DaCapo Press; 1999). Stevenson, James A., "Contrasting Lincoln's Gettysburg Address and Pericles's Funeral Oration", (Lincoln Herald, Summer 1996). Warren, Louis Austin, Abraham Lincoln's Gettysburg Address: An Evaluation, (C.E. Merrill Co., 1946). Warren, Louis A., Lincoln's Gettysburg Declaration: "A New Birth of Freedom", (Lincoln National Life Foundation, 1964). Weiser, Frederick S., "Lincoln's Trip to Gettysburg", (Lincoln Herald (Summer 1953)). Wieck, Carl F., Lincoln's Quest for Equality: The Road to Gettysburg, (Northern Illinois University Press; 2002). Wills, Garry, Lincoln at Gettysburg: The Words That Remade America, (Simon and Schuster, 1982). Wilson, Douglas L., Lincoln's Sword: The Presidency and the Power of Words, (Knopf, 2006). Barton, William E., Lincoln at Gettysburg, (Indianapolis: Bobbs-Merrill Company, 1930). Holzer, Harold et al, editors The Lincoln Forum: Abraham Lincoln Gettysburg, and the Civil War, (DaCapo, 1999). LaFantasie, Glenn, "Lincoln and the Gettysburg Address,", (Journal of the Abraham Lincoln Association, Winter 1995). Luhrs, Henry E., Lincoln at the Wills Home and the Gettysburg Address, (The Lincoln Publishers, 1938). McVeagh, Wayne, "Lincoln at Gettysburg", (McClure's Magazine, November 1909). Nevins, Allan, editor Lincoln and the Gettysburg Address, (University of Illinois Press, 1964). This is one of many myths about President Lincoln and the Gettysburg address, according to historian Gabor Borritt. The Gettysburg College historian contends that Brooks was not present for Mr. Lincoln’s photographic session on November 8 and the President could not have received any copy of Everett’s speech until after November 14, when Everett himself received it from the printer. Indeed, it was not until November 2 that cemetery organizer David Wills wrote Mr. Lincoln: “It is the desire that you, as Chief Executive of the Nation, formally set apart these grounds to their sacred use by a few appropriate remarks. It will be a source of great gratification to the many widows and orphans that have been made almost friendless by the great battle here, to have you here personally, It will kindle anew in the breasts of the comrades of these brave dead, now in the tented field or nobly meeting the foe in the front, a confidence that they who sleep in death on the battlefield are not forgotten by those in authority; and they will feel that should their fate be the same, their remains will not be uncared for.”2 But Lincoln scholar Douglas L. Wilson surmised that Lincoln already knew he would be invited since “on October 11, Wills told a correspondent for the Philadelphia Inquirer that ‘President Lincoln is expected to perform the consecrational service.’ This would mean Lincoln had significantly more time to prepare than previously believed.”3 Indeed friend Joshua Speed recalled being told that “he was anxious to go – and desired to be prepared to say some appropriate thing.”4 Everett had already been invited on September 23 to address cemetery dedication ceremonies that were then planned for October. Everett replied that the earliest date he had available was November 19, which was when the ceremonies were duly scheduled. At Gettysburg the President went to Mr. Wills who expected him and our party broke like a drop of quicksilver spilt. McVeagh young Stanton & I foraged around for a while – walked out to the College got a chafing dish of oysters then some supper and finally loafing around to the Court House where Ward Hill Lamon was holding a meeting of [parade] Marshals, we found journalist John W. Forney and went around to his place Mr. Fahnestocks and drank a little whiskey with him. He had been drinking a good deal during the day and was getting to feel a little ugly and dangerous. He was particularly bitter on Montgomery Blair. McVeagh was telling him that he pitched into the President coming up and told him some truths. He said the President got a good deal of that from time to time and needed it. “He talked very strangely referring to the affectionate and loyal support which he and Governor Andrew Curtin had given to the President in Pennsylvania: with references from himself and others to the favors that had been shown the Simon Cameron party whom they regard as their natural enemies. Forney seems identified fully now with the Curtin interest, though when Curtin was nominated he called him a heavy weight to carry and said that Cameron’s foolish attack nominated him. “We went out after a while following the music to hear the serenades. The President appeared at the door said half a dozen words meaning nothing & went in. Seward who was staying around the corner at Harper’s was called out and spoke so indistinctly that I did not hear a word of what he was saying. Forney and McVeagh were still growling about Blair. “We went back to Forney’s room having picked up Nicolay and drank more whiskey. Nicolay sung his little song of the ‘Three Thieves’ and we then sung John Brown. At last we proposed that Forney should make a speech and two or three started out Shannon and Behan and Nicolay to get a band to serenade him. I staid with him. So did Stanton and McVeagh. He still growled quietly and I thought he was going to do something imprudent. He said if I speak, I will speak my mind. The music sounded in the street and the fuglers came rushing up imploring him to come down. He smiled quietly told them to keep cool and asked ‘are the recorders there.’ ‘I suppose so of course’ shouted the fugler. ‘Ascertain’ said the imperturbable Forney. ‘Hay, we’ll take a drink.’ They shouted and begged him to come down[.] The thing would be a failure – it would be his fault &c. ‘Are the recorders congenial?’ he calmly insisted on knowing. Somebody commended prudence He said sternly ‘I am always prudent.’ I walked down stairs with him. It was a noisy night in Gettysburg. The town was overrun by visitors. President Lincoln stayed at the three-story home of David Wills, where more than three dozen people were accommodated. Nevertheless, Mr. Lincoln closeted himself in his room and worked on his manuscript that night and early the next morning. There was a good deal of drinking and revelry on the eve of the dedication. People who found a bed counted themselves lucky. Mr. Lincoln was fortunate to be housed near Secretary of State William H. Seward, whom he consulted on the manuscript late that night. The next morning, the mood in Gettysburg shifted from sodden to solemn. Between 9 and 10 A.M., Mr. Lincoln again worked on his manuscript – in the company of private secretary John G. Nicolay. The President then joined the official procession from the center of Gettysburg, where he was staying, to the new cemetery on the ridge where the Union Army fended off Confederate assaults on July 1-3, 1863. Lincoln colleague Ward Hill Lamon recalled: “As soon as the dignitaries who occupied the stand, numbering perhaps 250, were seated, Hon. Edward Everett & Rev. Thos. H. Stockton appeared, escorted by a Committee of Governors of States, and being seated, one of the bands struck up and performed a solemn piece of music in admirable style. That over, Mr. Stockton made one of the most impressive and eloquent prayers I ever heard. The Band then played, with great effect, Old Hundred. Mr. Everett then arose, and without notes of any kind, pronounced an oration. He occupied two full hours in the delivery, and it was one of the greatest, most eloquent, elegant, and appropriate orations to which I ever listened. I stood at his very side, through it, and I think the oratory could not be surpassed by mortal man.19 Almost two hours after he began, Everett concluded his remarks. Lincoln aide John G. Nicolay’s daughter Helen later wrote: “Newspapers stated that Mr. Lincoln read from a manuscript in his hand. My father sat only a few feet away, and his distinct recollection was that the President held the manuscript but did not read from it, his delivery by being far more than a mechanical reading of written words. My father’s recollection is borne out by the fact the speech as taken down in shorthand by the Associated Press and printed next morning in the newspapers does not follow exactly the written words. My father thought it most likely that, during the ride to the grounds and the delivery of Mr. Everett’s oration, Mr. Lincoln fashioned the phrases anew in his silent thought and had them ready when he rose to speak.”21 But that was one of several controversies regarding the text, according to Lincoln biographer William E. Barton: “As to his manuscript, we could prove that he had no manuscript with him on the platform; that he had a manuscript, but that it was either a card or a piece of paper not larger than a card; that he had some notes on paper of rough appearance, presumed to have been those that he had written on the train; that he delivered his address from notes on a yellow envelope….”22 His short speech generated long controversies. Beginning with the next sentence he spoke more rapidly, but somewhere near the middle of the address he slowed again to the tempo of the opening words. Now the group of Negroes off to one side, that had been wailing ‘Amens’ in an undertone, lifted their voices higher and higher as the simple eloquence of Lincoln moved them. A number of them were weeping; others with closed eyes repeated phrases of the address. The deep resonant voice continued: ‘…whether that nation, or any nation, so conceived and so dedicated can long endure.’ These words were spoken very slowly indeed. With the next sentence he quickened his delivery, and when he came to ‘gave his last full measure of devotion,’ tears trickled down his cheeks, and I could not help some welling up in my own eyes. Historian Frank Klement wrote: “It was nearly three o’clock in the afternoon when president Lincoln, orator Everett, and Governor Curtin arrived back at the Wills house in Gettysburg. Mrs. Wills supervised the serving of a well-planned meal for ‘a very large company.’ Wills then transformed his house into a reception center, placing Lincoln in the hall opening on York Street where he greeted guests as they entered and placing Governor Curtin at the door front on the public square to shake the guests hands as they were leaving. Herbert Mitgang, editor, Washington, D.C., in Lincoln’s Time: A Memoir of the Civil War Era by the Newspaperman Who Knew Lincoln Best, Noah Brooks, pp. 252-253. Abraham Lincoln Papers at the Library of Congress. Transcribed and Annotated by the Lincoln Studies Center, Knox College. Galesburg, Illinois. (Letter from David Wills to Abraham Lincoln, November 2, 1863). Douglas L. Wilson, Lincoln’s Sword: The Presidency and the Power of Words, pp. 208-209. Douglas L. Wilson, Lincoln’s Sword: The Presidency and the Power of Words, p. 211. Herbert Mitgang, editor, Washington, D.C., in Lincoln’s Time: A Memoir of the Civil War Era by the Newspaperman Who Knew Lincoln Best, Noah Brooks, p. 253. William E. Barton, The Life of Abraham Lincoln, Volume II, p. 191-192. Allen Thorndike Rice, editor, Reminiscences of Abraham Lincoln (James B. Fry), p. 403. Michael Burlingame and John R. Turner Ettlinger, editors, Inside Lincoln’s White House: The Complete Civil War Diary of John Hay, pp. 111-112 (November 18, 1863). Allen Thorndike Rice, editor, Reminiscences of Abraham Lincoln , p. 514 (E. W. Andrews). Rufus Rockwell Wilson, editor, Lincoln Among His Friends: A Sheaf of Intimate Memories , p. 226 (Wayne MacVeagh, “They Heard Lincoln at Gettysburg”). Michael Burlingame and John R. Turner Ettlinger, Inside Lincoln’s White House: The Complete Civil War Diary of John Hay, pp.112-113 (November 18, 1863). Herbert L. Caron, “Nor Long Remember: Lincoln at Gettysburg” , Pennsylvania History, October 1961, p. 367. David Herbert Donald and Harold Holzer, editors, Lincoln in the Times; The Life of Abraham Lincoln as Originally Reported in The New York Times, p. 189 (New York Times, March 5, 1861). Allen Thorndike Rice, editor, Reminiscences of Abraham Lincoln , pp. 510-511 (E. W. Andrews). Frank Klement, The Gettysburg Soldiers’ Cemetery and Lincoln’s Address, p. 29. F. Lauriston Bullard, “A Few Appropriate Remarks’: Lincoln’s Gettysburg Address. Gabor Boritt, The Gettysburg Gospel, p. 102. Gabor Boritt, The Gettysburg Gospel, p. 169. Allen Thorndike Rice, editor, Reminiscences of Abraham Lincoln (E. W. Andrews), pp. 515-516. Helen Nicolay, Lincoln’s Secretary, pp. 177-78. Roy P. Basler, editor, Collected Works of Abraham Lincoln (CWAL), Volume VII, p. 23 (Gettysburg Address, November 19, 1863). Victoria Radford, editor, Meeting Mr. Lincoln, pp. 68-71. (George D. Gitt, “First Meetings with Lincoln in War Days,” Liberty magazine, November 1933). Benjamin French, Witness to the Young Republic, pp. 435-436. Robert S. Harper, Lincoln and the Press, p. 286. Doris Kearns Goodwin, Team of Rivals: The Political Genius of Abraham Lincoln, p. 586. David Herbert Donald and Harold Holzer, editors, Lincoln in the Times; The Life of Abraham Lincoln as Originally Reported in The New York Times , p. 189 ( New York Times , November 20, 1861). Paul M. Angle, “Lincoln’s Power with Words”, Journal of the Abraham Lincoln Association, 1981, p. 26. Gabor Boritt, The Gettysburg Gospel, p. 119. Allen C. Guelzo, Abraham Lincoln: Redeemer President, pp. 371-372. Louis A. Warren, Lincoln’s Gettysburg Declaration: “A New Birth of Freedom”, p. 6. 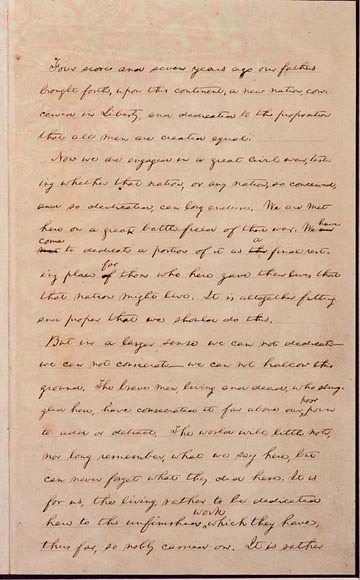 Louis A. Warren, Lincoln’s Gettysburg Declaration: “A New Birth of Freedom”, pp. 112-113. Douglas L. Wilson, Lincoln’s Sword: The Presidency and the Power of Words, pp. 233-234. Benjamin French, Witness to the Young Republic , pp. 435-436. Frank Klement, The Gettysburg Soldiers’ Cemetery and Lincoln’s Address, p. 18. David Herbert Donald and Harold Holzer, editors, Lincoln in the Times; The Life of Abraham Lincoln as Originally Reported in The New York Times, p. 189 (New York Times, November 20, 1861). Ward Hill Lamon, Recollections of Abraham Lincoln, p. 173. Ward Hill Lamon, Recollections of Abraham Lincoln, p. 175. Harold Holzer, editor, Dear Mr. Lincoln , p. 134 (Letter from Edward Everett to Abraham Lincoln, November 20, 1863). Don E. and Virginia Fehrenbacher, editors, Recollected Words of Abraham Lincoln (Louisville Commercial, November 12, 1879), p. 411. Rufus Rockwell Wilson, editor, Lincoln Among His Friends: A Sheaf of Intimate Memories , p. 228-229 (Wayne MacVeagh, “They Heard Lincoln at Gettysburg”). Gabor Boritt, The Gettysburg Gospel, p. 139. Gabor Boritt, The Gettysburg Gospel, p. 141. Herbert L. Carson, “Nor Long Remember: Lincoln at Gettysburg, Pennsylvania History, October 1961, p. 37 (Harper’s Weekly, December 5, 1863). Robert Fortengaugh, Abraham Lincoln at Gettysburg, November 18 and 19, 1863, Pennsylvania History, October 1938, p. 243. Douglas L. Wilson, Lincoln’s Sword: The Presidency and the Power of Words, p. 236. Douglas L. Wilson, Lincoln’s Sword: The Presidency and the Power of Words, p. 235.